We humans continue to be astonished at the sentience of other beings; Atkinson says, “The first thing it tells me that is that grief isn’t owned by humans.” Rather than marvel that this grieving orca is “like us,” we might do better to wonder how we ourselves have moved so far from carrying our own dead, keeping them afloat in the ongoing stream of our lives, and counting on the help of our people, our pod, to do this heavy lifting that is more than any one should bear alone. Our emphasis too often is on “closure” rather than on how we continue caring for our relationships with our dead. We outsource the care for our dead to professionals, be they old-school funeral directors and crematory operators or the newer flavors of death doulas and midwives. Even our DIY approaches to death can enshrine self-sufficiency – my death, my way, a far cry from what we’re seeing in the Salish Sea. There are numerous accounts of elephants grieving: shedding tears, standing vigil over their dead for as long as three days, traveling long distances to visit the bones or dying grounds, moving the bones, perhaps even trying to bury’ them. To carry a dead baby for a week, to stand over a corpse for three days – these acts seem strange to us now, in an age when funerals have been rebranded as Celebrations of Life and 90 minutes might well be considered too long, and many of us have never been to a cemetery. And yet these forms of mourning are part of our heritage too: harrowing, distressing, asking more of us and of each other than we might think possible, binding us unmistakably to the great wheel of life from which we so easily now become untethered. I think it is a form of ‘Orca wake’ you are describing. It is not unlike us being with the dying and and being with the body after death has occurred. This might be unusual for many people, but for many other people it is not. It is quite normal to sit with the dying person, to sit with the body in the mortuary after an accident or to bring the body home if the person has died in hospital, for friends and family to gather round to sit with the body until the funeral. It is the old or the new normal. It is part of the natural death movement, which embraces death as part of life. And it is quite a natural, normal thing to do for the family to organise the funeral. It is all quite simple, but you need a community to work together to do this. Otherwise you need to call in a home funeral advisor or a funeral director and they will do things with you, or for you, whatever it is you prefer. But I take your point, in general in Western society we rush around and ignore our dying or our dead, we are so busy in our rat race lives that to take out for this sacred process of dying and for being with the dead seems impossible to do, but it really needs rethinking. The value system needs rethinking. What is this life if full of care, we have no time to stand and stare….. Of course in this case it is not about time to stand and stare, it is time to sit and be. And in being still we gain something profound. It is worth stopping to take time out to be with our dying and our dead, for our own sake – and for theirs. Josefine, thank you for writing so thoughtfully about taking time for and with our dying and dead. As you say, there are many in today’s world who still, or again, do so. I was generalizing about the default norm in the dominant culture of North America. You and Nicholas with the Natural Death Centre were among the first to light the signal torches on the road back to the death care traditions that were once a part of every European-descended person’s birthright. I agree that a different relationship to time and to reliance on community are both needed if we are to rebuild this capacity. I always appreciate hearing from you – best wishes for all in your care. I am not trying to make this a conversation between just the two if us, perhaps others would like to join in? Of course I realised what you were saying your article about general attitudes to death which in effect are a form of splitting off from connecting with emotion and the process of dying, which is always an emotional event, because it is a reminder of death, of everyone’s eventual death, and particularly our own death. And this emphasises that ultimately we are having to surrender to a higher power, a process we are not able to control. The orca story is new to me, I had not heard of it before, and it makes perfect sense. It is very moving. 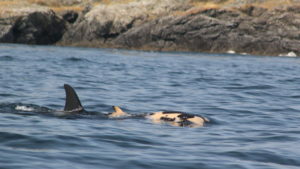 Who knows if perhaps this orca mother had special cause to grieve like this? Other traumatic events may have affected her to make her react to the death of her child in this way. The thing I wanted to add this that I have learnt that what is good for the dying is good for the living, and this comes down to supportive, caring relationships and community. A sense of belonging. Basically it is the community who accompanies and cares for the sick and dying. We need to create that and value that. It is a tragedy that we do not realise that community is so vital to our well being. Today in Europe and in America we lead increasingly isolated lives, even virtual lives. We need daily physical contact with people we love and care about, that is community. Thanks for your beautiful blog, Holly! Keep up the good work! I’m just now seeing another comment arrive – looking forward to seeing the conversation develop as you’ve invited, Josephine. thank you for your words here Holly. I am drawn to remembering the story from a fellow scholar who, on the death of her husband slept with his body that night, knowing it was that last night she would sleep beside his physical form. This moved me so deeply, to know you would not touch again this one you loved so well. I shared this story with a few people and found their reactions to not always match my own. It seemed a fearful or disturbing act to some humans that I hold so dear. This fear of living life in the presence of death is a deep glamour, a dark spell. I so appreciate the call to help each other hold up the dead in our own lives and keep them present, not forgotten. Beautifully put, Marianna, thank you for working to break that spell that creates an apartheid between the living and the dead. The Seattle Times is covering this daily, and they said that scientists are keeping distance now. But when the mother eventually drops the baby whale, they’re going to retrieve it to study. This could be valuable knowledge that could provide evidence for advocacy and policy changes. – BUT I can’t help but think that the mother will be cognizant of where the baby is left and what if she visits the location and the baby is gone?? Susan, yes – the whole thing is deeply troubling on so many levels. Lots of grave robbing has been done in the name of science, and we know so little about the full consequences. When I first read the story in The Oregonian, I posted it on my own website for I was deeply moved and continue to be as the journey of the orca family is ongoing. I appreciate where this thread is unfolding. Such depth. Another thought I have had is that this dead calf and her mother are part of the critically endangered southern resident family of orcas. This calf, which the mother held in her womb for 18 months, represented hope for their family’s survival. With the calf’s death I can’t help but wonder if they are experiencing collective grief; that with this death, another sliver of hope died away too. So much to reflect on in this story. We have much to learn. Thanks for adding your thoughts on this, Anne. Yes, so much here, truly a mythic story for and of our times.